As you may know Holocaust Memorial Day was established in the year 2000. In that year 47 governments came together and agreed to preserve the memory of those who have been murdered in holocaust. They chose the 27th January as that is the day which marks the liberation of Auschwitz-Birkenau, the largest Nazi death camp. Their memory is sustained through acts of education, remembrance and research. For me this year’s Holocaust Memorial events are even more poignant. 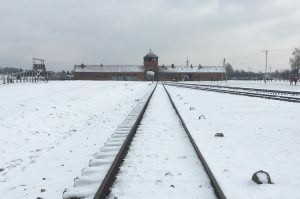 I recently made my first visit to the death camps of Auschwitz- Birkenau. So having made that visit I feel it is important to bear witness as part of our acts of remembrance for Holocaust Memorial Day 2019. I thought I was reasonably well read in issues around the war, the rise of the Nazis and the destruction of human life in the concentration camps. Can I assure you that none of that could adequately prepare me for the experience of walking around Auschwitz and Auschwitz- Birkenau. I know some of you may have been – and you will therefore know the way in which everyday objects – a shoe, a cup, a cutting of hair, an item of clothing – can trigger such emotional reactions when set in the context of industrialised slaughter – the holocaust. As the Holocaust Memorial Trust tell us genocides are always planned. You do not kill over a million people in a concentration camp without planning and organisation. To witness the evidence of that process leaves a mark that can only renew a deep commitment to action and remembrance. (Inscription: “to the memory of the men, women and children who fell victim to the Nazi genocide. Here lie their ashes. May their souls rest in peace”). And so it must be for every genocide. 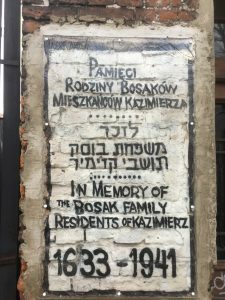 In Krakow I stayed in the Kazimierz Jewish district and saw the reminders of a life that was destroyed by Holocaust. Here is just one piece of artwork that reminds us all of the lives and the long history that was destroyed. This Sunday, 27th January, I will be honoured to speak at an event in St David’s Church, Merthyr Tydfil to mark Holocaust Memorial Day 2019. The theme for my address is – “torn from home”. This seems such an appropriate theme for 2019 as it seems barely a week can go by – often not even a day – when we are not faced with a new story about people who are “torn from home”. The challenges of being “torn from home” in the face of war, conflict and persecution. Seeking to escape because of their faith, their politics, identity, gender or their sexuality. All of them holding that basic desire for a safe and better life. On Monday of this week I was also pleased to join local groups and volunteers to say a few words of thanks to mark the important work undertaken on the Holocaust Memorial Garden located just behind Merthyr Tydfil library. That event marked the start of Holocaust Memorial Week and it allowed us to turn our minds towards this day of remembrance. The memorial garden is a peaceful spot for reflection and for remembrance. 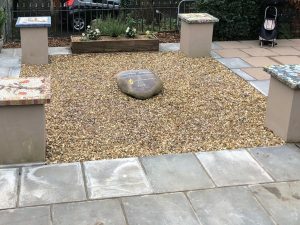 We gave our thanks to the staff of Merthyr libraries service – who in 2016 were able to secure an initial £1000 grant from the Holocaust Memorial Trust to start the process of creating the Holocaust Memorial Garden. We thank others who have contributed to that project in recent years. As we were reminded on Monday Merthyr Tydfil was the only place in the UK to receive a grant that particular year. 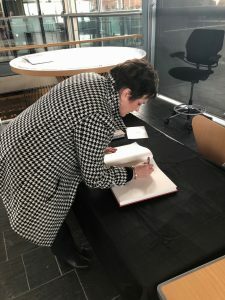 I signed the Holocaust Memorial book in our National Assembly for Wales on Wednesday. I know Gerald Jones MP did the same in our Westminster Parliament. In the Assembly we held a vigil on the steps of the Senedd and were joined by Holocaust survivor Henry Obstfeld. I was also privileged to be called and make a 90 second statement on Holocaust Memorial Day in our Senedd on Wednesday. You can listen to the statement here. Why is remembrance and our holocaust memorial garden important? I think its importance lies in the value of connecting us to the bigger picture – it reminds us of the importance of remembrance and the horror of genocide. After attending the event on Monday I returned to my office in the National Assembly and in the post that day was my “Holocaust Memorial Day activity pack”. This is a rich resource but full of painful reminders about genocide. 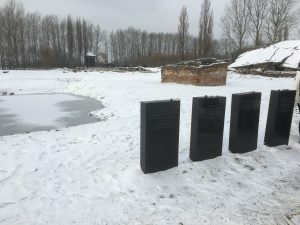 Last Monday morning – after we had gathered in the memorial garden we went in to the Redhouse and looked at an exhibition about both the project and about genocide. In the exhibition we faced that stark, cold, reminder – genocide does not just happen. Genocide under the Nazis, in Cambodia, in Rwnada, in Bosnia and in Darfur today – does not just happen. Genocide starts with acts like divisive language – and in the targeting of people because of their identity.